Do you read nonfiction books? I do, quite a bit, and always enjoy them! As you may recall, a while back I posted that The Radium Girls by Kate Moore was my favorite nonfiction book this year and I am definitely sticking to that. However, today I thought I would write a little about two other great nonfiction books I read in 2017 – both of which I gave five stars and both of which relate to Labor relations in America – much as The Radium Girls did. 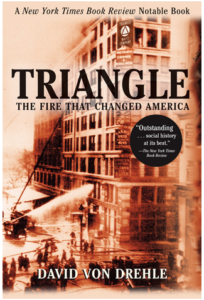 The first, Triangle: The Fire that Changed America by David von Drehle, tells the harrowing story of the disaster at the Triangle Shirtwaist Factory in the Greenwich Village industrial area of New York City back in 1911. The fire, that started close to the top of the building swept through three floors and ultimately took the lives of close to 150 people – mostly young, immigrant women. This book tells their stories, the events of that infamous day and the results that such a catastrophe set into motion. An amazing and tragic story- one with lasting effects for worker and workplace safety. Somewhat surprisingly, I had never come across this historical event before and I am so glad to have read this book. Best described as an in-depth examination of the Labor movement, immigration and politics of the time; this book is intimate and startling, as well as fiercely moving. I loved it and learned so much! 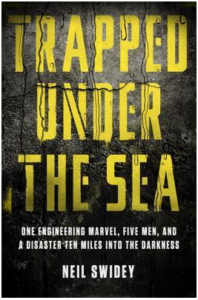 The next, Trapped Under the Sea: One Engineering Marvel, Five Men, and a Disaster Ten Miles into Darkness by Neil Swidey, focuses on the waste treatment plant project on Deer Island in Boston Harbor back in the 1990s. Due to a massively polluted Harbor the Commonwealth of Massachusetts undertook this enormous project that required multiple different companies, teams and specialties. This is mainly the story of the tunnel under the Harbor and the 5-men sent in at the end to remove plugs prior to use. I really enjoyed this book although I found it depressing – the truth is sometimes depressing. I think it is an important read, especially for the people of Massachusetts (of which I am one). I think the author did a great job of memorializing the “ordinary heroes” -the men who took on this project; two of whom didn’t make it out alive. A classic David versus Goliath tale but unfortunately in this one, Goliath wins. I loved the engineering and science aspects of this story as well. A good reminder to us all that behind the infrastructure of our country, that we often take for granted, are the lives of thousands of men and women who risk their lives to make it possible.